Hi everyone, Steph Ackerman here today and as the summer starts to wind down it's time to think about school restarting. It's always fun to send the kids off that first day with something new, useful, and fun, as well as practical. I think it kind of takes away the edge of starting anew. This notebook was not only fun to create, but also very practical. Add your child's name to the cover and she'll have something to show off to her friends. 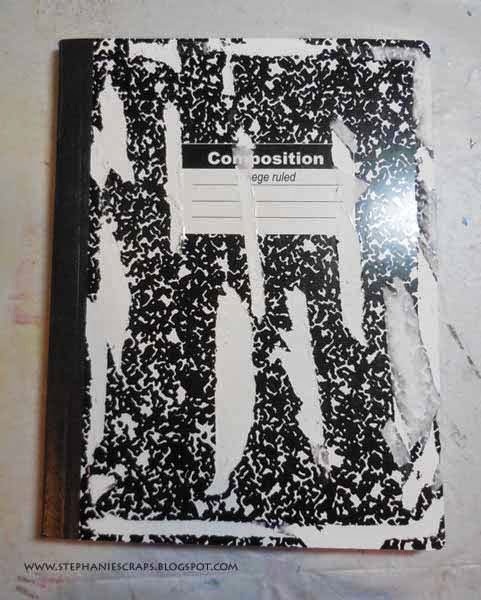 I started with a notebook that desperately needed some revamping. 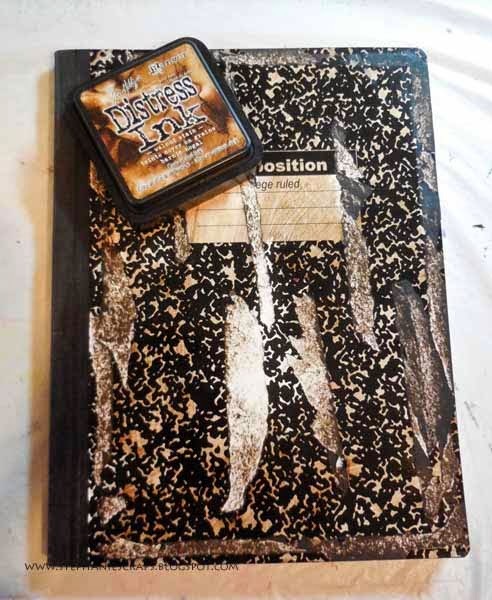 Using Walnut Stain Distress Ink, I first inked the front cover, then cut white cardstock to fit the front of the notebook, and also inked it with Walnut Stain Distress Ink. I cut blue cardstock slightly smaller than the front cover. 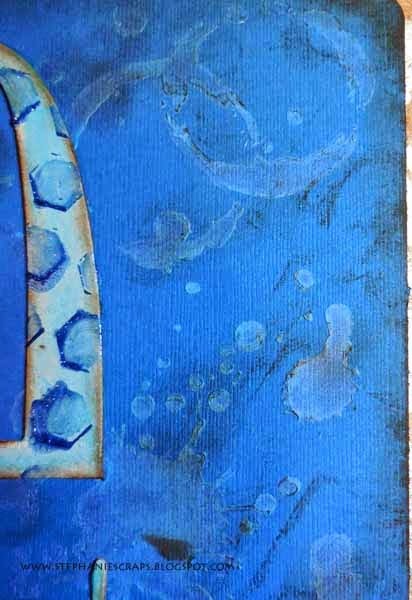 Placing Tim Holtz Splatters stencil on the cardstock, I used Aloha Velvet Art Anthology paint. 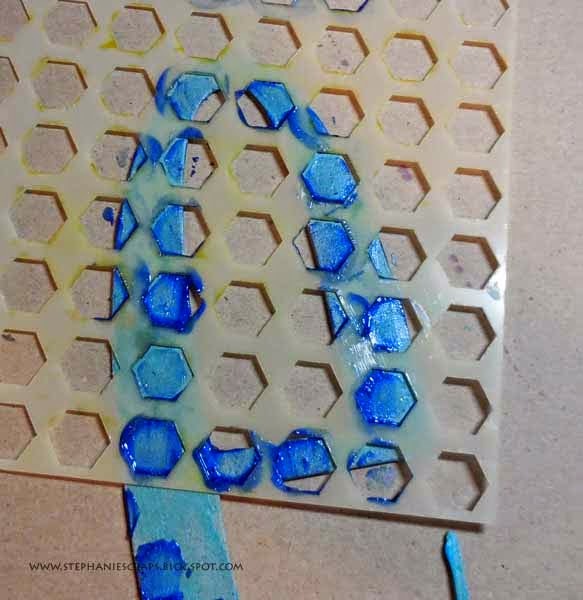 To get paint into the small spaces, I used my fingers then moved the stencil around the cardstock until I had the look I wanted. 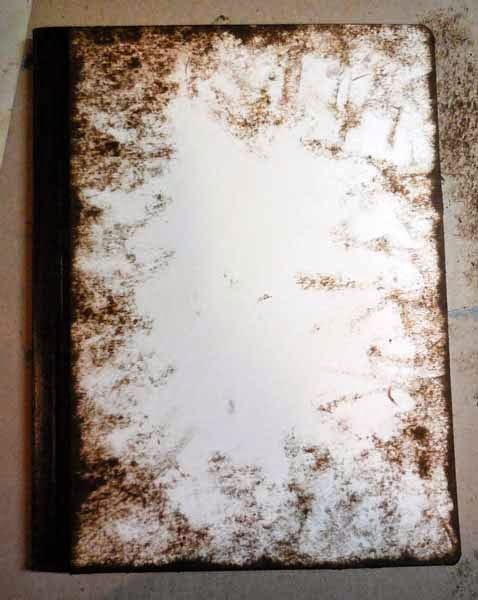 Once it dried, Walnut Stain Distress Ink was added around the edges and the panel was adhered to the front cover. 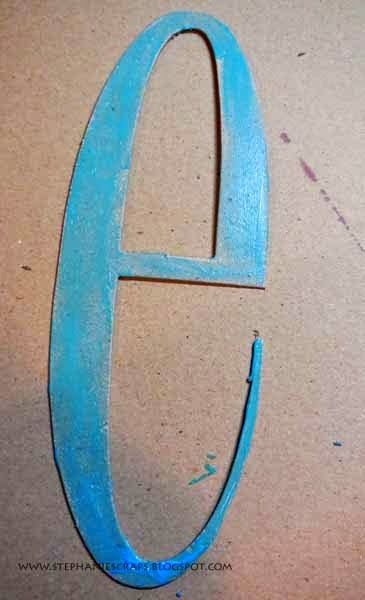 The letters were cut from Grungeboard and painted with Aloha Velvet Art Anthology paint . 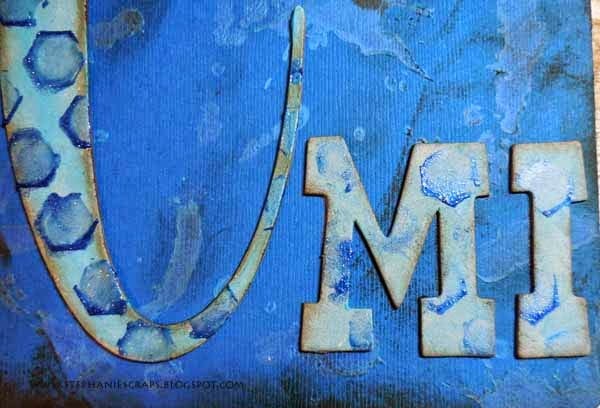 Using a stencil with Art Anthology's Honolulu Blue Sorbet paint, additional dimension was added to the letters. The letters were then inked with Walnut Stain Distress Ink. 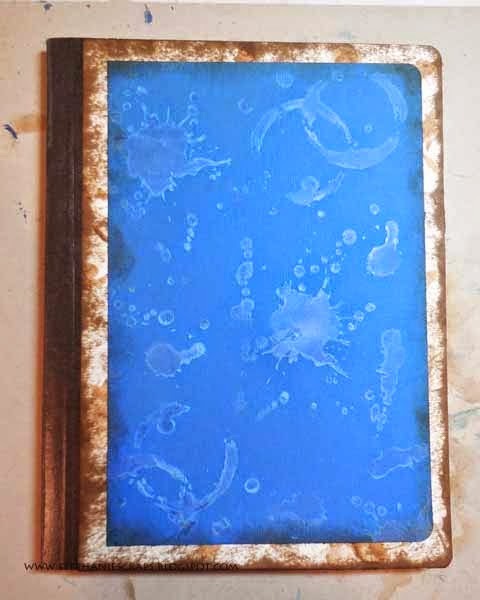 To grunge up the cover some more, I used Blending Foam to add Walnut Stain Distress Ink over the painted splatters. I think Emi will be happy with her new notebook, don't you? What cool and FUN idea! Steph, LOVE the BG you created with the splatters and the stenciling on the letters! FAB transformation ready for back to school! 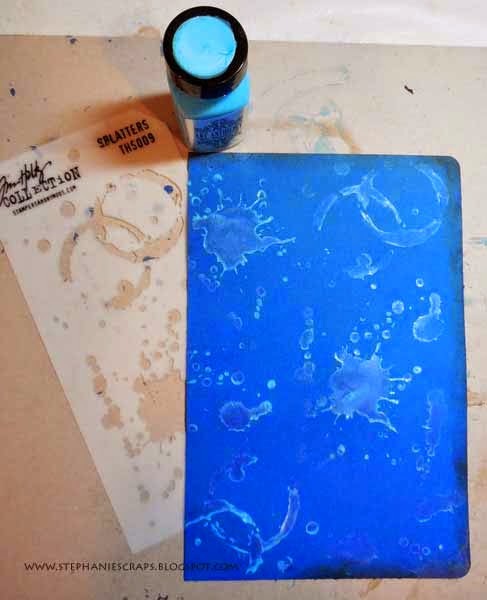 The splatter stenciling looks super on the bright blue cover you created Steph! 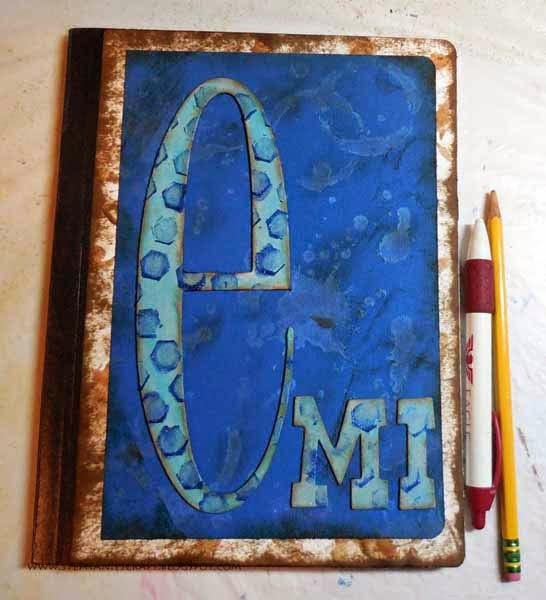 what a great way to dress up this notebook - and so fun to personalize it! Steph! This is a fabulous repurpose! Love it and the elements you choose!